Object: click on each star and turn them into arrows. Each arrow can point either up/down left/right or diagonally. If a cell has #5, that means 5 arrows must point to it. Suppose you're in the middle of the game and that cell is now a 2. That means that 3 arrows are pointing at it & it needs 2 more arrows. If a cell has a -1, that means that one too many arrows are pointing at it. When all the cells are 0, you have solved the puzzle. Shannon's father died suddenly - this set her on a course to travel the world. Theory: Jacob, is an evil SOB. He killed Shannon's father. Recall: Jacob prevented Sayid from getting hit by a bus, but it was okay for the wife to get run over by the speeding bus. Jack was furious when his wife left him for another man. The other man was Jacob!!!! Ben brought Locke to the cabin to meet Jacob. Locke heard 'help me.' Theory: the voice belonged to the smoke monster. Which implies that maybe Ben was communing with the smoke monster all along instead of Jacob. Or maybe Ben had no idea that the smoke monster resided there. We've seen Ben lie many times. But Hugo? In the episode of Richard's origin, we see Hugo being a medium at the end of the show to Richard's wife. He tells Richard that she says to prevent the man in black from leaving the island - when in fact - she says nothing of the kind. Implication: Jacob did control her. Older episode: Ben takes John to the cabin to meet Jacob. Ben does not see/hear anybody but pretends to have a conversation w/ Jacob. Then John hears 'help me'. Theory: that was not Jacob! It was the smoke monster. Proof: when Ilana brings her crew to the island - they burn the cabin down. And she is on the island to protect Jacob. This puzzle is similar to Tower of Hanoi, The Brain etc. 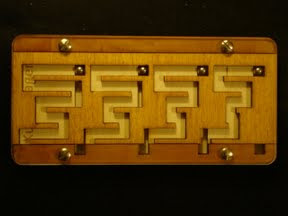 The object is to slide the balls to the opposite end by shifting right and left the dark wooden piece. 1250 moves! Moreover, it's easy to lose track and accidentally reverse the direction and move back to the starting position. Intellectually stimulating? No, since there's no thinking involved. Nevertheless, it's an intellectual achievement and belongs in the collection of serious puzzlers. Produced by Jean Claude Constantin. Scroll down a bit to see photos of the Fadi Cube. This Mechanical Puzzle Correspondent scrambled it - bravely. So far - unsolved. Corners - trivial. 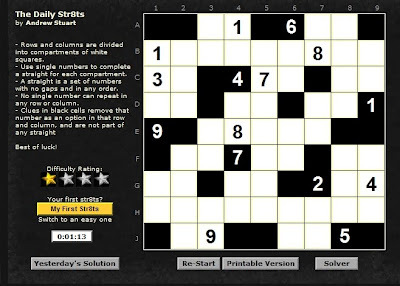 Edges - easy algorithm. 4 centers on each face - daunting! Fear not, puzzle blog followers! This Mechanical Puzzle Correspondent will sacrifice his occupation & social responsibilities to determine a workable, repeatable solution. When I'm done, don't forget to applaud. Arlene is a serious runner. Every morning she runs one loop of her route. She runs downhill at 6 mph. She runs uphill at 2 mph. If Amy runs her route clockwise, it takes her 1 hour to complete 1 loop. If she runs the route counter-clockwise, it takes her 2 hours to complete 1 loop. Find the distance of 1 loop. Our puzzle friends of the north now can tune in to the puzzle scene with a homegrown puzzler: Nancey Vanstone! Follow her & stay apprised of future puzzle parties in the Toronto area. The Great Nation of France is definitely on the rise. First, the President had the good sense to marry the lovely Italian Carla Bruni. And now, LAB MICE PUZZLES will soon be available in France. 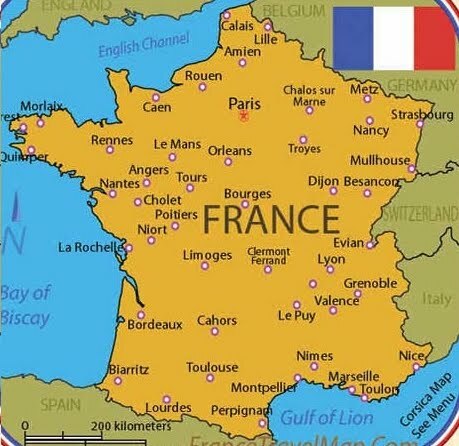 C'est magnifique pour tout le monde! 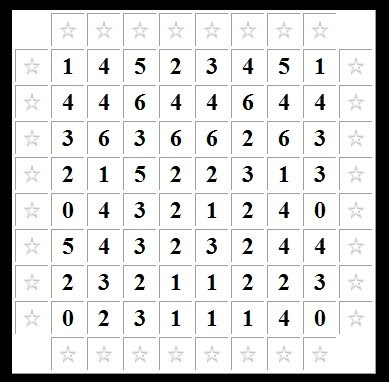 Jeff Widderich has created an interesting version of sudoku here. Buttonia is a Lights-Out puzzle game. In a normal Lights-Out game, pressing one button changes the status of all the surrounding orthogonal buttons. In Buttonia, the individual jewels have different properties. Diamonds that point up and down - change only the neighboring up/down buttons. The square button changes all the neighboring buttons including the diagonals. Tres interessant! Neville Attard and Sven Neumann did the work! 99 cents gets you 170 puzzles. The Fadi Cube from Oskar van Deventer has an interesting turning mechanism. Observe the photos. This may be the only 'twisty' puzzle that can have 1 corner be incorrect - see image. $435 may seem like a lot of money for a single puzzle, but there are only a few of these in existence. Solving: this Mechanical Puzzle Correspondent has figured out how to handle the edges and corners. The 4 center pieces on each face.....daunting! Season 2: Kate, Locke & Sayid find the crazy Russian mercenary named Mikhail - he with the patch over his right eye. They fight, his house explodes, they take him as a prisoner. Mikhail tries to explain something to Kate then says: "never mind you're not on the list." Current season: Kate is a candidate. Hmmmmm. Mikhail explains that he was the last of the Dharma initiative. Why was he not killed by Ben & the Hostiles? Theory: Jacob touched him - making him immortal. Then, Mikhail leads the party to the electric pylons outside the grounds/barracks around the Others. Locke throws him into the electrical force field - killing him. As he's being electrified, he says 'thank you.' Of course, Mikhail comes back later to kill Charlie. In the last episode, we are given a surprise - Desmond is back - seemingly without Penny. I have no idea why. However! We have not seen the last of WALT. He's not only going to come back, he's going to kill John Locke by throwing a knife into his chest 'before he can speak a word'. And then Walt will become Jacob's successor - even though he's not a 'candidate'. Sorry for spoiling the show's conclusion.